Could you have diabesity? 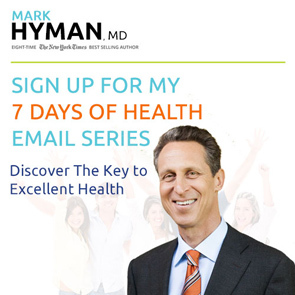 Unjunk your diet and heal yourself with food with Dr. Mark Hyman’s 6-week plan to lose 20 pounds and reverse your diabesity. Plus, Dr. Mark Hyman shares Blood Sugar Solution Cookbook comfort-food recipes! Mark Hyman, MD, believes that we all deserve a life of vitality—and that we have the potential to create it for ourselves. That’s why he is dedicated to tackling the root causes of chronic disease by harnessing the power of Functional Medicine to transform healthcare. He is a practicing family physician, an nine-time #1 New York Times bestselling author, and an internationally recognized leader, speaker, educator, and advocate in his field. He is the Director of the Cleveland Clinic Center for Functional Medicine. He is also the founder and medical director of The UltraWellness Center, chairman of the board of the Institute for Functional Medicine, a medical editor of The Huffington Post, and has been a regular medical contributor on many television shows including CBS This Morning, the Today Show, CNN, The View, the Katie Couric show and The Dr. Oz Show.